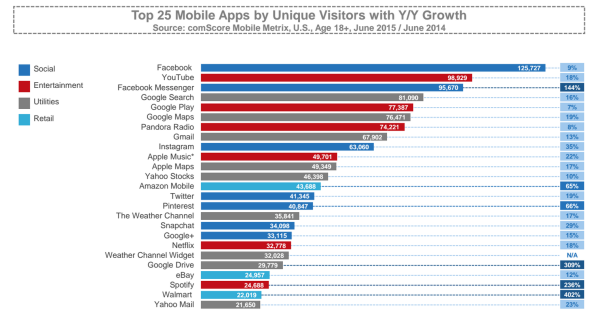 New York City-based venture capitalist Fred Wilson recently posted an observation on his blog that should fascinate any marketer with even a passing interest in reaching mobile users: None of the top 25 mobile apps in the U.S. is owned by a startup. What’s more, Wilson observes, according to digital media analytics firm comScore, 10 of the top 12 apps are owned by Apple, Facebook, and Google (with the latter two owning the top six, and eight of the top nine), while Snapchat, the youngest company on the list, is already more than four years old. Also worth noting is that five of the apps are used for entertainment (Spotify, Netflix, Apple Music, Pandora Radio, and YouTube), eight for communication (Yahoo Mail, Google+, Snapchat, Twitter, Instagram, Gmail, Facebook Messenger, and Facebook), three for shopping (Walmart, eBay, and Amazon Mobile), two for navigation (Apple Maps and Google Maps), and two to check the weather, illustrating the limited range of services that have proven most popular with mobile users. Though Wilson expects something new to come along – like the Internet itself did in the mid-’90s – and break the present oligopoly, he’s not yet sure what it might be. Meanwhile, the current data seems to indicate that despite appearances to the contrary, marketing departments big and small can rest assured that by focusing their efforts on a handful of established companies – such as Google, Apple, Amazon, and Facebook, which Wilson calls the “big four” – they’re soundly covering their bases and need not worry about every new social networking phenomenon they read about online.